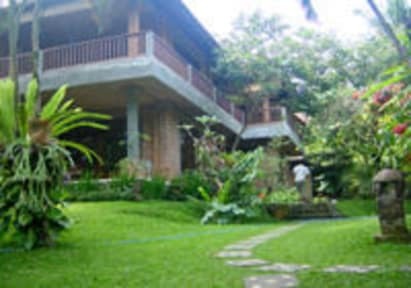 We offer budget accommodation at a reasonable price, within walking distance of the heart of Ubud and approximately a 90 minutes drive from Denpasar Ngurah Rai International Airport. 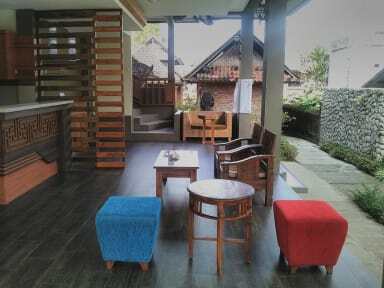 We are one of the most comfortable guest houses to stay at in Ubud which located in the famous Hanoman Street, one of the major streets in Ubud, where most of the tourism facilities centered. Although we are surrounded by hotels, shops, cafes, yoga studios, spas and restaurants, you will find yourself living in tranquility as our rooms nestled in our lush back yard. Here you will enjoy spacious rooms with en suite bathroom with cold and hot water, fan, where most of them are having their own private balcony which overlooking to our lush garden. More facilities, such as air conditioning, bath-tub, and private kitchenette are provided in our Superior rooms to meet our guests' comfort and ideal for those who want to spend their holiday longer. And to make your holiday at ease, we also provide you with in house reception, daily housekeeping, and free WiFi in all rooms. Other additional services also available with additional cost applied, such as: airport transfer, laundry service, postal service, photocopying, tour arrangements, boat tickets to Lombok and Gili islands and rental of cars, motorbikes and bicycles. Vegetarians and Vegan guests are welcome to stay with us as welcome as those who are not in certain diets. And last but not least, our family and staffs will do our best efforts to make your stay in Ubud memorable. I originally booked 2 nights and ended up spending 10 nights at Indraprastha. Mira and her family are warm and welcoming, breakfast is good and varied (vegetarian and vegan options available), rooms are comfortable and cleaned every day. All the best restaurants and yoga spots are within walking distance. Zero complaints! Amazing place! Mira was such a wonderful host and all her staff (Madame Rry and the guys) were all so accommodating and friendly! Booked for one night, ended up staying here the entire time we had in Ubud. We had an activity early one morning they made sure we had breakfast even packaged it to go. Very comfortable and clean room and bed, beautiful and peaceful area, perfect place to stay. If I'd improve anything, the shower head was a little small/weak. Overall I highly recommend! Beautiful place. Lovely family. Couldn’t have wished for a better stay. Everything was great! Pretty well located, the staff was lovely and ready to meet your requests! Definitely I’ll be back! Awesome friendly staff, very clean rooms. Quite and calm atmosphere perfect for a relaxing getaway! Fantastic place to stay. If you’re not sure about a homestay, you shouldn’t be worried at all. Mira and her family were very welcoming and the rooms are lovely and clean, with hot showers! Breakfast is fantastic and the location is also great. Indraprastha was excellent. The owner Mrs. Mira was very friendly and very considerate towards her guests. On our arrival she briefed us properly; the facilities, the neighborhood, and she also checked whether her guest has any food allergies because breakfast is provided on the house. I came with a friend whose vegan and she provided us vegan breakfast. She also offered her guests to re-fill our water in the common area in order to reduce plastic waste. I truly recommend this place to stay! It had very little atmosphere when I was there in March but it's an ideal location and Mira (who runs it) is absolutely fantastic! Excellent location and super friendly, helpful staff. Nice breakfast and atmosphere. Would stay here again.